Approximately 35 species of pine trees can be found in North America. 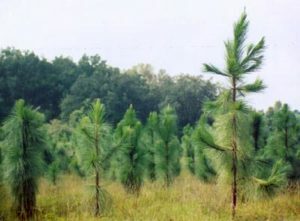 Some of the most common types of pine trees are Sugar Pine, White Pine, Longleaf Pine, Shortleaf Pine, Bristlecone Pine, Red Pine and Foxtail Pine. Most pine trees grow well in dry, acidic soils, but they also can survive in more extreme conditions such as poor soil and water-logged areas. While pines are native to the northern hemisphere, they have been identified in areas as far away as Central America and Indonesia. Because of their evergreen leaves, pine trees are a popular choice for landscapers looking to add year-round color to an area. Pine wood is also frequently used in furniture making along with mulch. Pine trees are great for shade and the pine straw is great for landscapes and gardens. Contact us today!